AmblesideOnline began as a labor of love by homeschool moms who believe whole-heartedly in Charlotte Mason's educational philosophies. We wrote it more as an educational tool for parents than anything else at first, to show how Charlotte Mason organized a term, how many books were used and scheduled, and so forth. We were surprised by the original number of people who wanted to give it a try as written--some 50 or 60. Our labor of love grew into a serious curriculum rather quickly, and while our users could still be numbered in the hundreds, the question of commercializing the curriculum was raised. We decided emphatically that it would remain a free curriculum, and over the years, it has grown to be a complete 12-year program with many extras, the collective labors of literally dozens of willing volunteers who shared our vision. No one has ever been financially compensated for contributing to AO, although the thanks of the Advisory and many thousands of users goes out to them all. The expense of maintaining the AmblesideOnline website, purchasing domain names, and so forth, was born willingly by Advisory members for over ten years before Amazon affiliate links were added to the website, which income now covers the costs of operating AO and has allowed AO to expand in several ways. 1. No one may put AmblesideOnline in the name of their product. 2. No one may copy and publish the curriculum elsewhere. 3. No one may use the AO email list or forum to advertise their products for sale. We have consistently refused all requests to do these things, not because we bear ill-will to anyone, but because we chose to make AmblesideOnline free, and no one else has a right to make a profit by using our name, and because we did not want AO users to become a targeted market. Many interesting projects have been proposed to us, and our refusals are not a reflection of the worthiness of any project, but rather we have followed these policies for the sake of AO's integrity and the protection of our members. Because we are in fact a group of homeschool moms and not a prominent corporation with a shiny catalog and hefty price tags, some have chosen to treat our free curriculum as open source. It is not. It is protected by copyright under the law, just the same as any other curriculum materials. In recent years, as AO has acquired thousands of users, we have encountered even more copyright infringement, and to our dismay, many of those infringing or would-be infringers have objected vehemently to our policies. We have chosen to be more vocal about the fact that AO is a copyrighted work and not free to re-post. We have asked enthusiastic users to police themselves, and consider carefully before reposting elsewhere. To those who argue that one cannot copyright a "booklist," although AO is much more than a booklist, we suggest a little research at copyright.gov. The booklist portion of AO is a "compilation" or "collective" work. From the copyright.gov website: "Compilations of data or compilations of preexisting works (also known as 'collective works') may also be copyrightable if the materials are selected, coordinated, or arranged in such a way that the resulting work as a whole constitutes a new work. When the collecting of the preexisting material that makes up the compilation is a purely mechanical task with no element of original selection, coordination, or arrangement, such as a white-pages telephone directory, copyright protection for the compilation is not available." AmblesideOnline was created with an "element of original selection," and no one else could create the same list by mechanical or objective means, as you would create a list of Newbery Winners, or Books Published in 1978. As such, it is entitled to copyright protection. We have been genuinely grieved not once, but again and again, by those who have characterized us as mean-spirited, and vilified us in public venues because we have determined to protect our copyright and the integrity of the AO curriculum as it appears on our website. We have been pained to see false accusations that we have threatened to sue somebody. This is unequivocally false. We have absolutely never, ever made such a threat. We have been discouraged, but there are other AO users who remind us often by their grateful letters to us, that our vision of a Charlotte Mason curriculum is appreciated by many, many more than those few discontented individuals. The AO Advisory, and the AO Auxiliary who have joined us to keep AO alive and improving are just as committed to our original vision as we always have been. 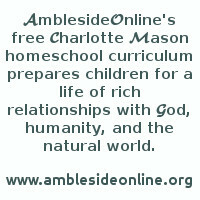 AmblesideOnline is a 21st century curriculum that attempts to recreate the depth and richness of the original curriculum Charlotte Mason wrote for the PNEU. It will remain free, and we will continue to adhere to the policies we have chosen to protect both the curriculum and the homeschooling families who use it. We know that stories and gossip have proliferated, and so we have chosen to make this public statement. We bear no ill will toward anyone, and our correspondence with all, even under difficult circumstances, has been prayerfully considered.